Our product range includes a wide range of centrifuge bucket corrector. Equipment is specially designed electronic differential balance for balancing the centrifuge bucket with blood bag.It measures weight of two buckets with blood bags simultaneously and display weight difference. · Audio buzzer and LCD display when both the buckets are balanced. · Optional Inbuilt battery Backup. · Leveling screw for balancing the equipment. · Inbuilt replaceable fuse for extra safety of the equipment. 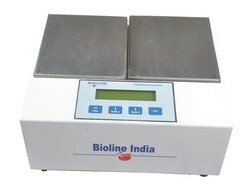 Calibration certificate for every equipment from a NABL approved lab. Looking for Centrifuge Bucket Corrector ?